This is an amazing bird. The great blue heron walks ever so cautiously through the water. Each step is placed like it is walking on thin ice. Not a ripple is made as it makes its way through the water. Near the edge of the water a fallen tree lies, the branches hang out over the water. With the help of the bird’s massive wings, the heron leaps onto a branch. When its wings are spread out, this giant of a bird appears like a pre historic bird. Now, on the limb, it stands motionless like a bluish, grey statue. The great blue is a territorial bird. Always aware of its surrounding, his head with its long sword like beak turns ever so slowly. It appears to be a passive bird. But, if something should invade its territory it will let out a horrific screech of a sound; with its large flapping wings and the sword like beak charging after you is enough to make the invader seek another place. Most of the time he is a very slow moving bird, except when he is catching a fish. When he spots the fish, he dives into the water like a bolt of lighting and with a great splash comes out of the water with its catch. I go to the river camera in hand, to photograph the ospreys. I search for the hawks but none seen. About two hours later six ospreys come to their favorite fishing hole. Now the survival of the fittest begins. After taking some photos a thought came to mind. 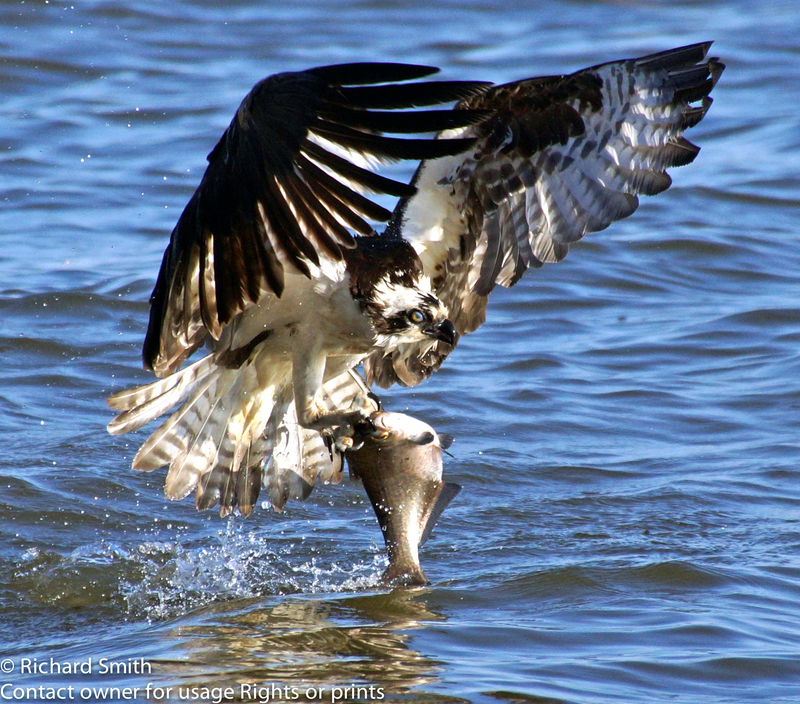 Do ospreys have a vision that reveal where and when it finds the fish? With its hypnotic trance-like yellow eyes it focuses with the intensity of a laser beam. The innocent fish below swims in search of edible aquatic life. The osprey from above the waters surface plunges to the water feet first. Its’ talons hit the fish like a bolt of lightning. Very few fish survive the bear like grasp of the osprey’s piercing talons. With wings powerful enough to knock a dog off its feet the osprey lifts its catch out of the water taking it to the nest to feed the family. The survivors are fish who swim deep enough to keep away from its flying predators. About seventy yards above the waters’ surface this osprey hovers like a helicopter, its yellow eyes focused on its prey. With a sudden-feet first plunge its talons open like claws. The bird of prey hooks its catch and off it flies with his fish. The osprey is a hawk known as a fish hawk. Its primary food is fish but will search nearby fields and swamps for rodents, snakes and other reptiles as a last resort. They build their nest out of sticks and debris placed in a tree, on rocks, or telephone poles. I often see nests built on day-markers and channel-markers. 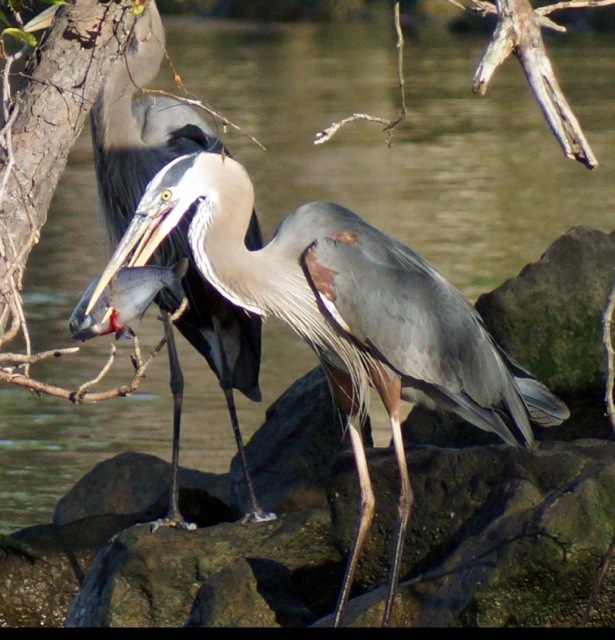 The male delivers the fish to the female on the nest who tears off pieces to feed to the young. April, the month the ospreys arrive from their winter range to begin the cycle of life. I captured the below photo in Newport News, VA at the spillway where Lake Maury overflows into the James River. Two hours before high tide the ospreys flock near the spillway to capture their bountiful food of herring, shad and other bait fish. As the tide moves in, the fish swim through the spillway into Lake Maury. In a tight circle, the osprey flies about 10 to 30 feet above the water’s surface. When the osprey spots its prey, it does an aerial dance. Its wings flutter to hold its position from the winds current. The ospreys yellow eyes are intense on its prey. With its wings folded it dives into the water. Within seconds the osprey swoops out of the water with a fish snagged in its talons.